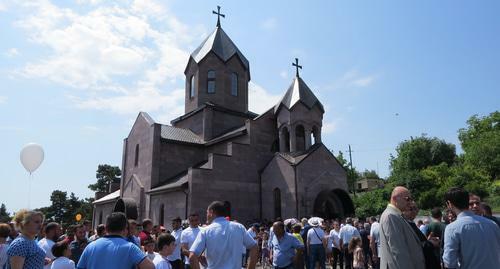 The consecration ceremony of the new church "Surb Vardanank", built for the funds of the charitable foundation "Development of Armenian Villages" took place in the city of Chartar, Martuni District of Nagorno-Karabakh. The Prime Minister of Armenia Nikol Pashinyan took part in the ceremony. The consecration was run by Archbishop Pargev Martirosyan, the head of the Artsakh (Karabakh) Diocese of the Armenian Apostolic Church, the "Caucasian Knot" correspondent reports. Chartar, which was awarded the city status in November 2014, is twenty kilometres from the troops contact line, the "Caucasian Knot" correspondent was told at the Mayoralty. Arthur Agabekyan, the Mayor, said that thanks to private charitable investments, funds and programmes, Chartar is developing at an accelerated pace; and, possibly, in the future, it will claim to be the centre of the Martuni District.